rhythm of the home. 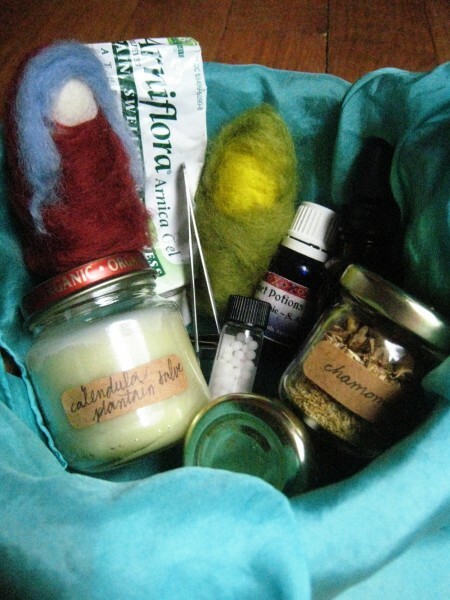 the healing basket and the healing friend finger puppet are my contributions this time around - with additional herbal assistance from my friend annie. serendipitously, last week meg posted about her family's healing basket on sew liberated. do look through those comments for a slew of ideas for building your healing basket! there are a ton i'd like to add to ours. i will definitely need a larger basket! in truth, we keep healing tools throughout our abode. you may remember seeing our herb shelves in this post. i keep tinctures on top of that shelf as well. we also have some herbal allies in the bedroom, the kitchen, and cabinets here and there. another idea i wanted to mention was suggested to me by some waldorf kindergarten teachers. they kept some smooth glass crystals in the freezer for little owies, in lieu of an ice pack. the magic of 'healing crystals' is very powerful for the little ones! you could even sew up a special pouch in which to hold them. what do you think? do you have any tried and true healers in your home? or out your doorstep? do share! and many many thanks to heather, bernadette and julia for another stunning issue of rhythm of the home!